When I was given free Yearly Membership to SchoolhouseTeachers.com, I was not planning to use it. If it is so great why have none of my homeschooling friends ever mentioned it? Besides, I am not one of those people who enjoys screen time. So much so that I write all my posts in long hand (yep, I know its 21st century) and I don’t watch TV. Our homeschooling consists of a couple of boxed curricula, kitchen science, lots of books, plus lessons, exercises and games of my own invention. But finally I got curious to see, if there was something interesting out there that I was missing and I took a look. I discovered that SchoolhouseTeachers.com is a great homeschooling resource and it deserves to be more popular. (Turned out SchoolhouseTeachers.com is a division of the Old Schoolhouse Magazine. You might have heard of it and you know it’s a resource you can trust). 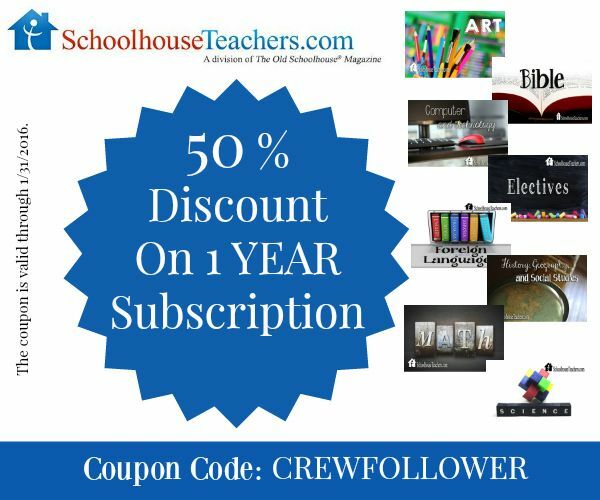 On SchoolhouseTeachers you will find over 200 courses covering preschool through high-school, many with at least a year’s worth of material with downloadables, printables, online classes, more than 10,000 videos, as well as Schoolhouse planners. They even designed classes for co-op settings. But wait that is not all! Here you will also find useful articles written by experts from Charlotte Mason homeschooling to homesteading, from parenting tips to whole foods cooking, from daily organizational tips to family fitness and series of articles to discover your child’s learning style. The website is expertly organized and everything you might possibly have in mind is at the tips of your fingers. The membership covers the whole family and you will find something interesting for all ages from preschooler to parents. Need some help with teaching math? No problem. Here you will find everything from printable worksheets to online practice as well as complete math courses for every grade. Looking for some preschool inspiration? Here you will find hundreds of printables and games to educate and entertain. Have a child interested in Drama? From monthly unit study drama/ classic plays with instructions for putting together your own production to 18-week course in public speaking to 10-months class that teaches how to write a play. There is no end of inspiration. Forget the kids. I want to take every class myself! I’m thinking of taking a 12-month course in Computer Science and Programming. I always wished I took this class in college. Oh and the 30-weeks Photography Class too! It will take the length of a small novel to describe every class that is offered by the SchoolhouseTeachers. Let me demonstrate how the website works. This is the screen shot of the homepage. As you can see you can browse the courses by subject and grade. I am going to click on Science page, but actually once you know what course you are interested in, the fastest way to go and get the lesson is Quick Links. Have you ever wondered how to teach kids science? Here is the answer. I’m going to select Tinker Club led by Dr. Ed Sobey to demonstrate how downloading works as this is what my son chose as his first course. It’s an eight-months course designed for little tinkers who like to take things apart. My son is very excited because not only he likes tinkering, but this is the first time he is in charge of the record keeping using Schoolhouse Teachers planners. So, to download just click on the link and select “save as” or “print.” You are done! I pride myself on building an unplugged family. My kids don’t play video games and watch very little TV. So is it possible to stay unplugged, while embracing online resources? Yes, it is. And printer is the name of the game. I simply downloaded all the courses of interest and printed them out. Each course went inside it’s own folder. Voila, our own textbooks. It takes a bit of time initially, but once you are done you are done. And much cheaper than buying actual textbooks. SchoolhouseTeachers is an amazing computer-based curriculum, in my opinion. You can get quality education in the comfort of your own home, working at your own pace and right now it’s available to you at half price. Use code “CREWFOLLOWER” at the checkout. The code is valid through the end of this month. Or try code name “TRIAL” to receive your first month for $1. Feeling ready to explore Schoolhouse Teachers website? Let me know in the comments. Disclaimer: This post contains affiliate links, for more information, please, read my Disclosure policy. This sounds like such a great homeschooling resource! I love how varied the courses are. There’s really something for everyone! Hey Buddy!, I found this information for you: "SchoolhouseTeachers.com Review Yearly Membership". Here is the website link: http://kidminds.org/schoolhouseteachers-review/. Thank you.